it will be called anti-fascism. Zbig Brzezinski is "Barack Obama's Evil Genius," according to Nessim Cohen-Tanugi, a French-Jewish political analyst, writing in Israel Actualites published in Jerusalem. How so? There are many Jews, even those seduced by Obama, who are troubled by some of his old --and new, alas-- associations and friendships. But the worst danger is yet to come: The presence at his sides of his advisor, Zbigniew Brzezinski, whom we consider a pro-Islamist Dr Strangelove. Everything has already been said about some of Obama's devilish old associations, his ties with the extreme left, Black Power racist, Black Nazi antisemite, Farrakhan. . . [Ayers, ACORN, and] the Syrian swindler Antoin Rezko, currently a boarder at a federal prison. But the future is much more troubling than the past because of the presence at his side of Jimmy Carter's national security advisor, now 79 years of age, Zbigniew Brzezinski. 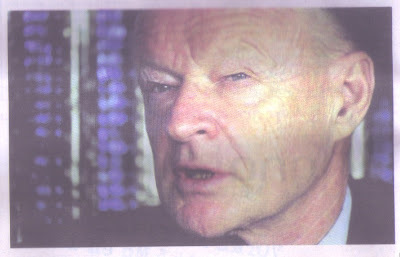 Zbigniew Brzezinski was the geopolitical theoretician . . . the architect of the American intervention in Afghanistan . . . It was he who elaborated the strategy called "the green belt." . . . that had as its goal the destabilization of Russia by igniting Islamism [Islamic fundamentalism]. In fact, Russia was encircled as by a belt by a series of countries with Muslim majorities (called green after the color of Islam), that were satellites in the framework of the Soviet Union. It was Brzezinski's idea to destabilize all these countries, secularized by Communism, by introducing into them the ferment of fanatical Islamism, with the help of Saudi Arabia. The Saudis were obviously interested. They sent a number of fanatical imams violently condemning secular Communist morals and calling on the Muslims to chase out the "infidels" who dared to subjugate Muslims. Afghanistan served as a testing platform and in a few years the fanatic Afghan rebels had obliged the Russians to leave the country. Osama ben Laden had been charged by the Saudis with managing the operation. We know with what success! In [an] article in Le Lien [of 2000] we had severely criticized this strategy, estimating that it was extremely dangerous to fight against one evil by using an even worse evil. We had warned the Americans, seduced by Brzezinski's theories, against playing "sorcerer's apprentices." Two years later [after the article of 2000], Osama ben Laden burnt down and destroyed the Twin Towers as well as part of the Pentagon. The White House was spared thanks to the heroism and sacrifice of the passengers of another Boeing. Alas, we were right beyond what we had feared. [This article by Cohen-Tanugi was published 28 Octobre 2008 in Israel Actualites]. After the destruction of the Twin Towers, which took about 3,000 lives, Obama's mentor Zbig spoke of "a few excited Islamic fundamentalists." What manner of monster is this? Coming: More on Obama's lies about the economy, Part II of "Barak Obama's Evil Genius," propaganda, psychological warfare, etc.